← @WISEUPforBM. Follow WISE Up on Twitter! We feel connected to you, here in Wales, because your mother is from here, and because you lived amongst us for a time, but mostly because you stood up and helped hold powerful people to account… Rest assured that even though you are separated from us, and cannot see us, we are here, and we are thinking of you, and we are testament to the fact that you are far more important, far more a world citizen, and have much more support around the world than they have, or ever will. Hang on in there – we support you. Please don’t lose hope. All the best. Hope everything goes well, all our wishes. If you did what they say you did then I am proud to support you… telling the truth is not a crime. Exposing criminal acts should not be against the law. It is a privilege to get the opportunity to write to you. The world needs more people like you. 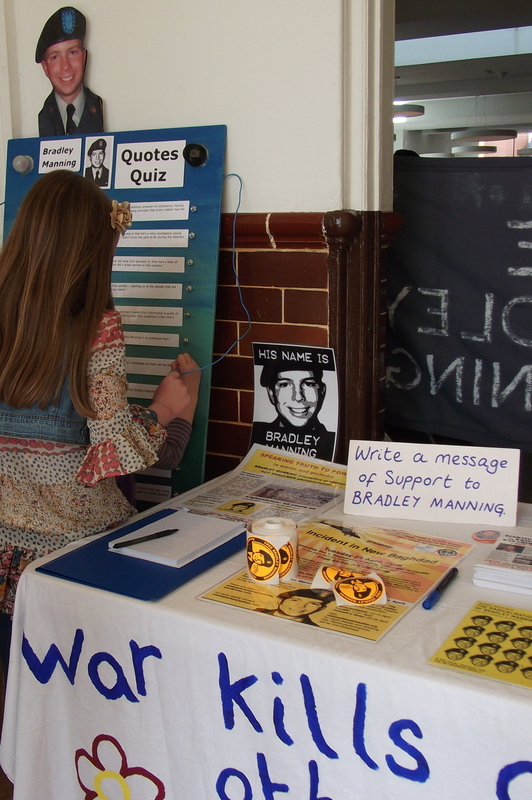 Saw the play ‘The Radicalisation of Bradley Manning’ – first I heard of your story. You’re making history Brad. Thanks. I am an Iraqi living in Wales… just to tell you that we are thinking of you and following everything that is being done to you and hope and wish for the best for you. We wish one day to meet you in person. Peace and solidarity from our hearts here in Wales. What you did was amazing… Stay strong! I love you. I don’t know you but I love what you’ve done. You are so brave. I feel… for the pain and suffering you have been through in the name of making this world a better place… the kind of place it should and could be. Whatever happens, be sure that your name and ideals will be celebrated in our home and with our children. Be sure you will be celebrated in songs and poems and well wishes from Wales. There’s a whole bunch of people here in Wales who support what you did and are thoroughly behind you. I’m sure history will judge you to be one of the heroes of this disastrous war. The truth will come out and your beliefs and those of your supporters will prevail. God bless you. I believe your bravery and integrity to be really inspiring. You and people like you are helping to restore my faith in humanity… good luck and best wishes from Wales. Take courage in bringing the truth to light for the sake of the many faceless and voiceless who’ve been denied Justice. Stay strong Bradley. There’s a lot of people supporting you. No words match your courage… we are proud of you. Stay strong. You’re in the right. We admire you for what you have done for us… standing for freedom of speech as well as telling the truth of the reality of war in Iraq and Afghanistan… Keep the faith and don’t give up. 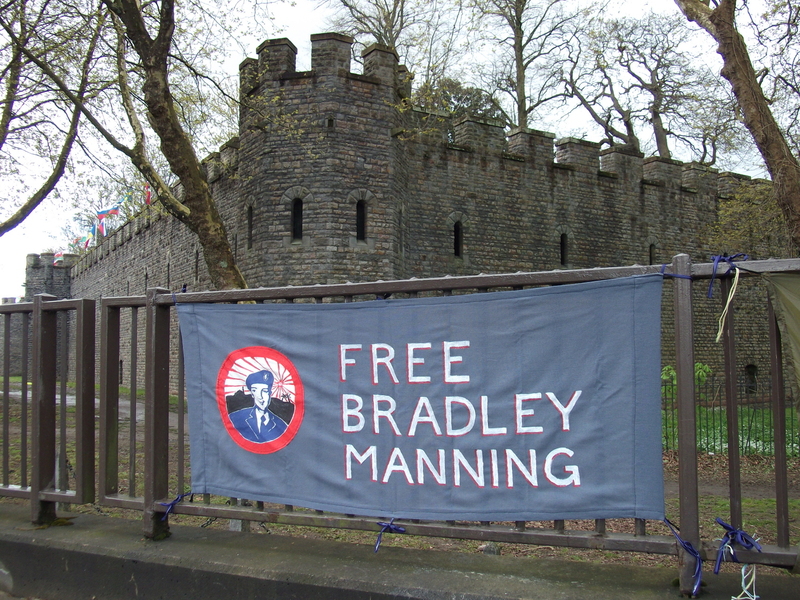 Gallery | This entry was posted in Manning, Reports and tagged Bradley Manning, Cardiff, Haverfordwest, letters, solidarity, Wales, Wrexham. Bookmark the permalink. Well done Bradley for being a witness to the truth and against war crimes. Your name will live when the names of Bush, Obama Blair ,and their cowardly “coalition of the Unwilling but Bullied” will long be forgotten and in disgrace.